I have always enjoyed homeschooling science. My children like the hands-on experiments that we do using materials found around the house. I will share with you activities that we have done in our home. Below you will find lessons for learning about life, the earth, space, and the world around us. Most of the activities are appropriate for elementary aged children. Some projects can be done with preschoolers. When you are homeschooling science you have the opportunity to teach about rocks, water, and the night sky. Weather lessons are easy activities that will help your child learn about how water, air, and heat from the sun interact to cause weather. Water Experiments has simple activities that will teach your children about the properties of water. Biology is the study of life. Even if you do not have a microscope you can observe nature. We have watch birds and insects in their natural habitat. Another idea is to go to the zoo and observer wild animals. We have always had dogs and cats. They can also provide an opportunity to observe life. Your child can see an animal grow from a baby to an adult. Your child can also learn that water, food, and safe shelter are important for all life. Biology gives an overview of how to avoid the controversy of the beginning of life. Read about some of the books that I used to teach biology and some of the activities that we did. Plant Experiments will help your child learn about how plants grow. All of the experiments can be done in your kitchen. Some don’t even require dirt. Gardening is another activity that can be done with children. Learn about activities that you can do with your children. Nature Walks offer the opportunity to observe different living things. On this page learn about how to find out where to go in your area and also what to bring on your trip. Graphic Organizers Help your child understand the different kingdoms with Venn diagrams and flow charts. Physics is the study of matter and energy. It has to do with motion, friction, and gravity. High school physics deals a lot with math equations, but you can do the experiments with younger children. Children like to build ramps for their cars. You can also make a marble run out of pipe insulation. Another idea is to make paper airplanes. My children were involved with a paper airplane contest. Each child tried to make a plane that would fly the furthest. Light Experiments has easy activities for preschoolers through elementary aged children. Magnets Experiments are fun activities that will teach your child about the magnetic force. Chemistry can be part of our homeschooling science program. We can teach our children about chemical reactions, the properties of matter and density. Chemistry provides an overview of how to homeschool this subject. You will learn facts about the subject. Kitchen Science has thirteen activities that you can do with your children in the kitchen. Food Science Experiments use food in unique ways. One of the activities involves making a cake without eggs. In another activity learn how to check for iron in your cereal. I believe in homeschooling science from a creation viewpoint. I try when possible to buy or rent Christian books, science videos, and curriculum. Even though most science books in the public library present an evolutionary view I do use them on occasion. I especially like books that have simple experiments. You can find the books in the science fair section. Science Curriculum lists books that we used teaching my children. 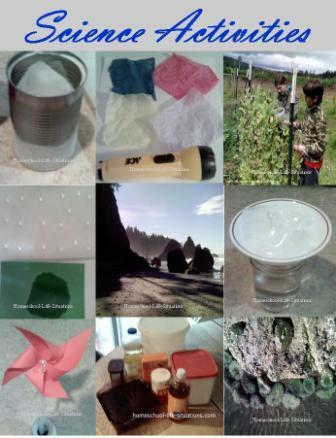 Homeschooling Science Supplies lists household items that you can use when teaching science. When our children get to high school it might be helpful to have a microscope or chemistry lab. Teaching through high school is still possible even without fancy equipment. Your child could go to a co-op, or receive credits through a local college. I hope that you enjoy my homeschooling science activities. Return from homeschooling science to the home page.